It’s not the soil itself, it’s the soil life that is the most important element! Microbes and soil life are fundamental to all crops yield, quality and health. Please read and understand what they do, their vital importance and how and why L-CBF BOOST™ works as a season-long sustainable low cost carbon source, whilst giving the opportunity to reduce other expensive inputs and actively improve the fertility of your main asset. Plant roots feed the microbes and fungi in the concentrated bacterial rhizosphere (root area) by exuding carbon compounds, including carbohydrates, fatty and organic acids, vitamins, enzymes and phytochemicals. L-CBF BOOST™, designed with similar carbon-based compounds, provides such a food source that increases their numbers and activity to improve availability and stabilise nutrients, leading to increased yields, quality, and health in whatever the soil conditions are, good or poor. Over the years the level of microbes have declined with less humus, the stable part of organic matter due to excessive tillage and pesticide applications. This leads to crops requiring even more fertilisers and chemicals, excesses of which can then damage the microbes. Microbes, including fungi, speed the uptake of nutrients and then release them in a plant available form. The fewer beneficial microbes there are, the less nutrients and other compounds they can provide and release. Rhizosphere microbes release chelating agents that increase availability of trace elements and tightly held soil nutrients so increasing crop uptake of them, including P, K, Mg, Mn, B and Ca. They also release growth promoters, including vitamins and hormones. Mycorrhizae fungi live symbiotically with the plant roots spreading their hyphae (fine branching filaments) far into the soil, increasing the roots absorptive area by up to a factor of 100, to include water and nutrients the plants cannot reach on their own. Other bacteria, actinomycetes and fungi protect roots from pathogens, inhibiting or killing them by releasing natural antibiotics such as penicillin. Some fungi digest other pathogenic fungi and nematodes that, for example, cause root diseases and rot. There are more living organisms in a handful of soil than there are people on earth. In just 1 gram of healthy soil there are 1 billion bacteria, 3 miles of fungi, 1 hundred thousand protozoa. Certain soil fungi control nematodes by trapping them in their tendrils to digest, but conventional farming practices with a high use of pesticides (fungicides in particular) and fertilisers have considerably reduced them. 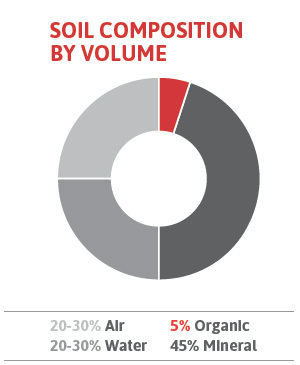 85% of nematodes are beneficial for soil and plants. Nitrogen fixing bacteria from the air release their N to the plant in an available form in the roots or when they die. In lucerne for example they can fix > 200kgs /ha of Nitrogen per season. The more artificial nitrogen applied, the less work these crucial bacteria do. Earthworms, which are hugely beneficial to all soils, feed on and farm the bacteria and fungi in the soil. They also manage plant residue and act as transport system for these microbes, increasing air in the soil and improving soil structure. They are the part of the soil food web that we can monitor and are good guideline of soil health. Worm castings contain a much higher amount of nutrients than the soil around them and in a more available form. So feeding the microbes with L-CBF BOOST™ increases their numbers, whilst slowly improving organic matter levels and its conversion to humus. These microbes then bridge the gap between plant and soil, allowing better fertiliser efficiency, higher nutrient availability and a more sustainable (or even regenerative) future. This is the way to maximise crop potential yield, quality, health and resistance to disease and drought. Applied with a pesticide for blight control L-CBF BOOST™ carbon sticks longer on the leaf, will kill aphids through bloat and attracts beneficial insects ie bees, ladybirds. A biological approach to farming with QLF Agronomy, feeding the microbes, balancing soil nutrients, improving soil structure and ultimately using less aggressive fertilisers and fewer chemicals, is the way to reversing long term trends of losing OM, declining soil health and microbe densities. In turn this will increase yields, soil fertility and quality but also reduce the increasing cost of chemicals used more and more to hold on to yields.